outright for new administrative offices. But when bureaucrats become involved, things never seem to go as smoothly as they should, and Kern Health walked away after the city set too many conditions. The two councilmen who represent the wards closest to the project - Terry Maxwell and Willie Rivera - called it a missed opportunity for downtown development and jobs in a time when growth is stagnant. On this issue, they got it right. 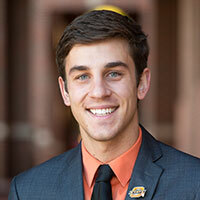 * ... ACHIEVER: Congratulations to Bakersfield native Connor Mojo who has been named an "outstanding senior" at Oklahoma State University. A graduate of Stockade High School and the son of Jeff and Dena Mojo, Connor is an industrial engineering and management major. He is a member of the Honors College and also served as vice president in the OSU Student Foundation (STUFU), an organization that promotes philanthropic giving on campus, as well as an officer in the Sigma Nu fraternity. * ... FOODIE: Friends have been raving about the new Victor's Mexican Grill on F Street downtown, so I sauntered in to see what the fuss was all about. Don't expect sit-down service or a cold margarita, because this place was birthed on the Chipotle model: a simple take-out menu featuring fresh burritos and bowls, all at a reasonable price with speedy service. If that is your ticket, punch it here at the new Victor's. * ... PADRE: And speaking of food, it was good to see that the folks over at The Padre Hotel finally succumbed and brought back some of the favorite bar food items that disappeared from the menu some time ago. The Brimstone's popular sliders and nachos are back, as well as some tweaks to the hotel's popular salads. * ... SPOTTED ON TWITTER: "If you don’t have anything nice to say, you’re probably just being realistic." * ... SPOTTED ON FACEBOOK: A friend posted this on his Facebook page: "I spotted a guy at Starbucks today. He had no smartphone, tablet or laptop. He just sat there drinking his coffee. Like a psychopath." * ... BAD FORM: Note to the driver of the white Mitsubishi with the gold "in loving memory" sticker on its back windshield: was it really necessary to toss your empty McDonald's cup and a handful of used napkins out your window the other day? * ... GOOD FORM: But hats off to the young man named Cody who came to the aid of a 93-year-old World War II veteran who had slipped in the parking lot while headed to Denny's on Panama Lane. He later spent time with him and walked him back to his motel. * ... BARBECUE: And don't forget the St. Francis of Assisi annual barbecue next Thursday in the east church parking lot. For $30 you get to hobnob with your neighbors and dine on a New York steak, fettuccine, green beans, salad and rolls, and all for a good cause.